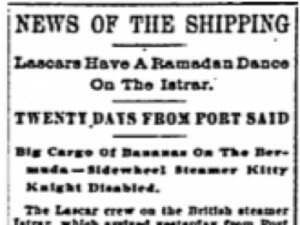 Some of the earliest news reports of Indian “lascar” seamen in the U.S. date back to the turn of the twentieth century in the port of Baltimore. 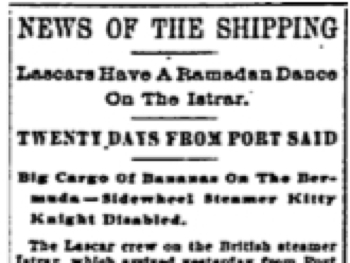 Baltimore became one of the primary U.S. ports where Indian maritime workers were either left in port or jumped ship. In the 1910s-30s, it appears to have been primarily a transit point – a place from which these men moved on to factory work in other locations in Pennsylvania, Ohio, Michigan, and New York. A small number of Indian ex-seamen, however, settled in Baltimore itself, in the African American neighborhood centered on Pennslyvania Avenue on the west side of the city. By the 1930s, the Pennsylvania Avenue district was the cultural heart of Baltimore’s African American community, and it was also home to small numbers of other immigrants of color, the Indians among them. In the 1930s, one ex-steamship worker opened an Indian restaurant on Pennsylvania Avenue, possibly the city’s first, just a short distance from the Royal Theater, Baltimore’s equivalent of Harlem’s Apollo Theater. Very little record remains of the Indian presence in this neighborhood.